If I have a friend with whom to share life, I will hold fast to my ideals. In the past couple of weeks, I have met on a couple of different occasions with sweet women who have opened their hearts. Both, mature, loving, committed to ideals and holding fast to investing their lives in their children and marriage, but both experiencing such isolation and loneliness. 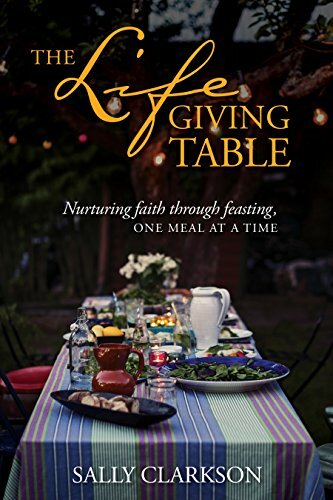 In our culture at this time in history, it is very easy to feel alone, especially when one feels called to focus her time and life on raising godly children, making a home that is the center of life and cultivating spirituality intentionally. The pressures that come with 24 hour a day children in the home, the housework, the messes, the education of each child and the load of work associated with these ideals can deplete a woman constantly. It is why Clay and I sought to develop small groups of women based around common ideals and why we are hoping to build a network of these women. It is why the girls and I wrote Girls’ Club, to try to foster strong female friendships and to build community so that women can join arm in arm across life, ideals and great causes. We need time to laugh and love and have fun and share our deepest struggles and challenge each other to ideals--and to feel that someone in the world "gets" you, loves you and will pray for you. I have been working so much lately on our conferences, book launch, podcasts and keeping up with packing for 4 cities and then Oxford, leaving in a couple of days. I was feeling a bit lonely and dry—all work and no play makes Sally a cull girl. I quickly called one of my friends I speak of in our Girls’ Club book. She is truly one of the most devoted women I know and always, always encourages me, prays for me and helps me feel loved. She is 14 years older than me. Though I stayed only an hour. She encouraged me, prayed for me, asked about my welfare and when I left, I was restored. My heart was at least partially filled and I felt I could make it through my week. All women, especially mamas who are at home with tiny, demanding wee ones, need the regular encouragement, love, fun, sympathy and support of other like-minded women to make it through their days with strength and grace to make it through their days. It is why we wrote our book, to help women understand the profound importance of being intentional to cultivate that few inner circle women who will link arm in arm to be the kind of friends we all need for life. I have been accused of using this word often—cultivate—because it is what needs to be done in relationships. “to promote or improve the growth of by labor and attention”, “to devote oneself to”, “to seek to promote or foster” and “to seek the acquaintance or friendship of”. All of these definitions are very clear. To cultivate is not a passive activity. It is one that takes work and attention and care. I have never seemed to have very much pause in life. The demands of my children, husband, friends, work, ministry, life have drained me on a regular basis. It is quite exhausting sometimes to be responsible! Cultivate insinuates you have to slow down, pause, water what needs to grow, care for it—and so it is with friendship—it must be planted, watered, receive nourishment and have time to grow. And all of us need to remember that unless we plant, we will not reap. 1.Take initiative and reach out. . Remember; cultivate means “to devote oneself to”. Ask the Lord to show you ways to cultivate a friendship with someone. 2. Encourage—look at the friend’s eyes—what do they tell you? How might you give words of encouragement to lift the other up. 2. Listen. Be someone who listens, not just talks. Make sure you know you are available to listen. People are not mind readers. You must tell them. 3. Support and do acts of kindness. Ask the Lord ways in which you can show love in action to friends. 4. Pray. Pray for your friends. Tell them you are praying for them. Ask them how you can pray for them. Ask them to pray for you. 5. Be dependable—through all seasons of life. Be a safe friend who can be trusted not to judge or criticize, but to love—Remember: love covers a multitude of sin. We talk about more ways we have found to be friends to one another today. Be sure to order your copy of the Girl’s Club Series. We know you will be glad you did. Stories to help keep all of us faithful to God and our ideals He has called us too. 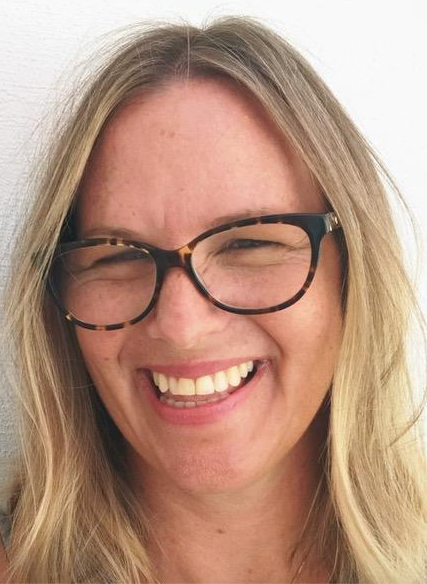 Greta Eskridge Podcast: Girls' Club Book Series! What fun we’re having as we prepare to launch the new book, Girls’ Club! Today I had the joy of recording a discussion with Greta Eskridge, a delightful mom who loves to encourage others. I hope you’ll love our conversation. I had the privilege of meeting Greta when we were both speaking at Wild and Free. I love her full engagement with life, celebrating moments with her children, and getting to watch the life she brings to so many through her messages and friendship. We also share a love for walking and hiking and being outdoors every day. Now, if she could just come to Oxford, what fun we could have on the canal, in the meadows and parks. And we would probably change the world with our conversations. I so enjoyed talking with her today about the profound importance of relationship as a foundation of strength for our lives. We also talk about the reason everyone on Insta knows her as maandpamodern (Ma and Pa Modern) —I always wondered where that came from, and now, when you listen to the podcast, you will know! You can also find her writing and speaking for Wild and Free events, and at various other home school and parenting conferences around the country. To find where she’ll be speaking next, check gretaeskridge.com! You will love this podcast with my lovely friend. And be sure to pre-order your copy of Girls’ Club, here! Kristen is also very graciously giving away a copy of Finding Selah to one of our readers! Leave a comment here or tag a friend on this poster on Instagram for a chance to win. And don’t forget to get a copy of Girls’ Club, here! Greetings from Sally, Joy and Sarah of The Girls’ Club Book. What kind of friend are you? I have a wonderful friend who is my "go to" friend when I need to be with someone who I know walks with the Lord. She is a kindred spirit, has a busy life, many responsibilities and we don't get to see each other very often because of our mutually busy schedules. But, I take the luxury of making special time to get together with her because I know I can count on the fact that she has been in the presence of the Lord and whatever we chit-chat about or whenever we share heart secrets, I know that I will be exposed to a heart that has been shaped by scripture, watered by faith and dwelling in the presence of the Lord. I know that just being with her will fill my cup, point me in the right direction, give me perspective. I also know that it has been her habit to walk with the Lord for years and years, one day--one devotional--one prayer at a time--so her wisdom is cumulative--years and years of experiences of seeing God's faithfulness and learning how to live by faith, and insight on how to look at life. "He who walks with wise men will be wise, But the companion of fools will suffer harm." I have had to look for these kinds of friends over the years. I once heard a leader say, "I will go to the ends of the earth to be around someone who makes me want to love God more and be more excellent. I will run quickly away from the kind of person who is always a drainer, complains and drags me down and depletes my desire to walk with God." I have thought about this philosophy over the years. We must all minister to a wide variety of people. Yet, I have purposefully sought to find friends to spend time with, on somewhat of a regular basis, who have the life of Christ bubbling up. This is to fill my own heart with wisdom from those who keep me seeking to pursue God in His holiness. Positive peer pressure, you might say. Excellent women are hard to come by, yet in each case, I find that these women are dedicated to pursuing God no matter what and their priorities show the investment they have made by making it a habit to spend time with the Lord on a regular basis--and then walk obediently, choosing to serve Him and His ways. Many of these women have terrible backgrounds and had to learn scripture and truth by pursuing it--but by pursuing the Lord in the context of His word and obeying it, they became reflections of Christ. Not about background, but about the priority of who you spend time with the most. How do you become a "go to" friend? Determine that you will read the word every day. Choose to believe in God every day, every circumstance, because it is way to please Him. Pray for His guidance and live with His presence going with you. It is the engaged, loving heart--the one that hungers to know and live for God--that will become the heart that others will draw from. There is nothing else to replace it--no cleverness or self-strength or rules or formula can replace the palpable life that comes from living day by day, holding on to God's hand, and then being a well-spring from which other draw. Do you want your children to draw from the Life that is bubbling over from your heart and mind and words and attitudes--then you must spend day after day with the Word of Life who will give you the true source of wisdom and love you long for. Even as a house is built one brick at a time and yet has the potential of becoming a mansion, so a wise woman builds her house one day--one brick at time into a home of spirituality that comes from rubbing up against Him so many times. Thanks, sweet friend, for spending so much time with Him so that I could be with Him when I am with you. Thanks, too, to all of my other sweet friends who pour His life into mine. (Those who are in my stories, in my book dedication, in my ministry and projects and work at my conferences, my blog and email friends. It is a host of watching women walk with God that waters my own heart. I am so very grateful for you! )I treasure you. You have made it possible for me to keep going in this life of ideals and faith in my sweet Lord. The girls and I find ourselves in a golden year where all of us reside in Oxford. It is a gift of all gifts to wander the streets where great people have studied, thought, written, led, lived history. Every cobbled street is filled with stories that inspire you to the depths of your own soul to seek to live a life that counts. We wanted to write a book that would also inspire you to your toes—to live into your capacity as a women, mother, friend who cultivates a great heart, fills her soul with beauty and truth, who uses her time, skills and love to bring light and beauty everywhere she goes. Oxford has been a place where each of us has found our own souls fed and challenged. So, with our very generous publishers, we conspired to send a winner and anyone else the winner chooses to come have tea with us in Oxford, to spend hours in conversation, and to tromp the same streets we have loved. We can’t wait to see who will join us there. - Comment (and tag a friend!) on our special giveaway entry posts (every Tuesday or Wednesday in the next weeks until launch on February 5) on any social media platform. You'll know which posts these are because they will be titled "OXFORD GIVEAWAY!" The more times you share and tag friends, the more entries you will receive. - It would mean so much to us and we’d be tickled pink if you would pre-order one of our books for yourself and a friend, so we can all celebrate the community of great women together. But, to win, officially, there is no purchase necessary. We will show you the cheapest ways to get here and where to stay and give you some amazing places to visit, even if you just come for a few days. 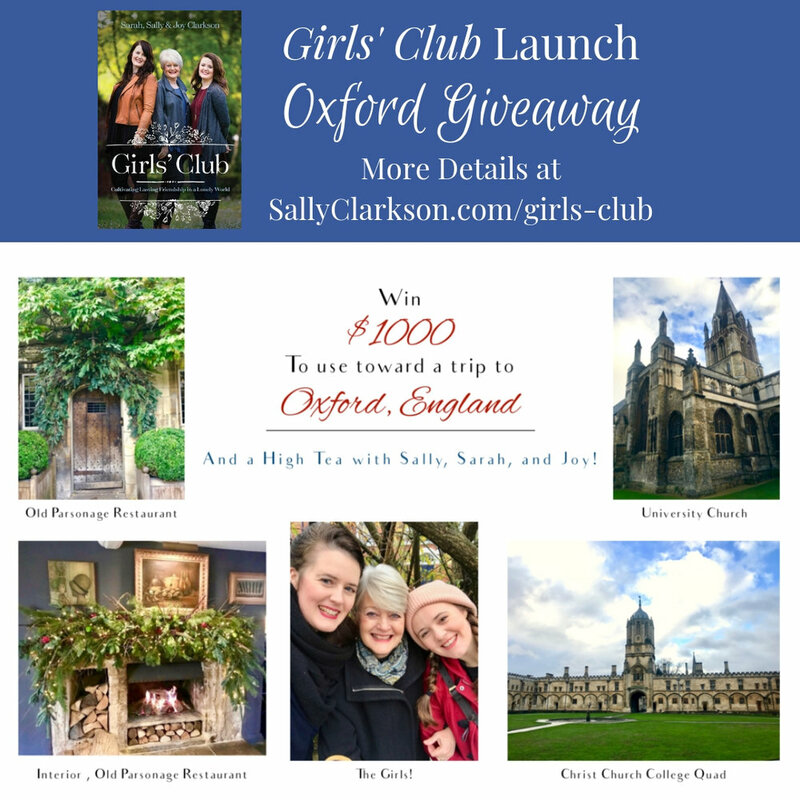 Go to my launch page @http://sallyclarkson.com/girls-club/ to find out more and to find the invitation to send to your friends for our launch party, February 5. If we were going to take a tour of Oxford or show you the way, this is what we'd do. Friends, this post is one of pure Oxfordian revelry, a bit of a treat to get you dreaming about a ramble round this dreamy old city.We have all lived here different amounts of time, (Sarah the longest) and when we pound the cobbles at dusk or in the early, autumn mornings, we often still feel the same in-drawn breath of joy. This city, with its cobbled lanes and golden-stoned nooks is a wonder of a place on earth (to use a Wendell Berryan term). It livens the sight and sparks the imagination. Sarah originally wrote this for friends far and wide, but Joy and I have now developed our own favorite places, all of which are in this list. And of course there are the canals behind our houses where we walk amidst the river and house boats every evening. There are the parks where we speak of great books, thoughts, writers, stories. There are new cafe’s and private gardens near our home, cakes, fish and chips, French soups and entrees to be had. Oh, why don’t all of you come! January comes upon us sometimes with a little darkness and weariness. Christmas promised to be delightful but sometimes the anticipation of family delight, celebratory days has not quite lived up to what we expected. We hoped to be spiritual but sometimes we feel guilty that we were so busy, we were not quite able to be still and worship as we had hoped. Add to that, the many days staying inside because of cold, the messes we are still cleaning up and amidst it all, our people still want to eat and wear relatively clean clothes. Learning that January is a season of waiting on God, learning to be content even through the sometimes monotonous days, is a part of life in which some of the greatest fruit will be formed. Growth takes time, muscle has to be built over many days of being stretched. And so I have learned not to despise the Januaries of my life. And so, during the waiting times, the slow times, God calls us to sow--to sow broadly, generously, diligently. While you are waiting, …, be sure to purchase your copy of The Girls’ Club. I think it will encourage you, give you some things to do during this season and help you to cultivate ways to develop community, closer relationships, (even with those in. your home!) It is our hope that it will fill your heart and delight your soul. JOIN OUR LAUNCH TEAM FOR GIRLS’ CLUB TODAY! WE WOULD BE SO HONORED IF YOU WOULD HELP US GET THE WORD OUT TO THE WHOLE WORLD ABOUT OUR NEW BOOK, GIRLS’ CLUB. WE ARE HOPING FOR A MOVEMENT OF WOMEN JOINING IN FRIENDSHIP AND FELLOWSHIP ALL OVER THE WORLD AFTER THEY READ OUR STORY. GO TO: GIRLS’ CLUB BOOK LAUNCH COMMUNITY ON FACEBOOK TO JOIN! 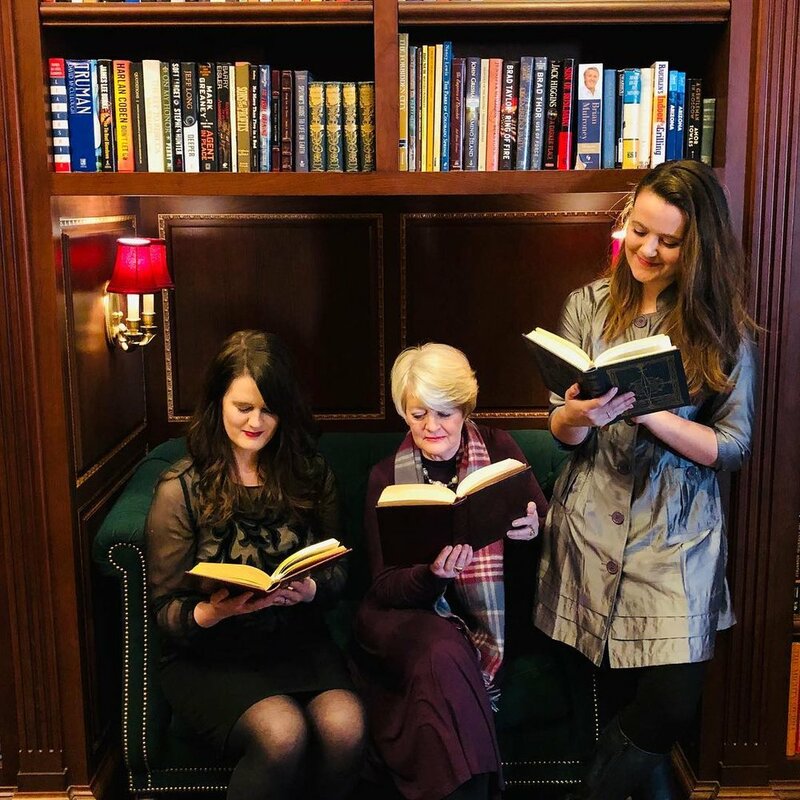 Fellowship, deep connection, and kinship among women has been a rich reality throughout all cultures and centuries. No matter the difficult circumstances that may have surrounded them, women came to appreciate their God-given heritage and to understand the legacy of love, wisdom, and skill they could live into by seeing it played out before them organically, day in and day out, with a community of women who lived close by. It is not so easy for us to see that pattern anymore. It seems to me that women in the twenty- first century have either forgotten the intrinsic potential they have as human beings and as women sharing in friendship and community, or they are just too distracted, overwhelmed, and busy to access the glory and beauty of their femininity and how it blooms more fully in the context of loving relationships. And of course, we are the most connected generation technologically and the most isolated from our neighbors. In our day, everything about womanhood and gender has been called into question, so that many are afraid or reticent to embrace the delight and joy contained in female friendships, the strength that is gathered in communities of women living harmoniously in support of one another, and the encouragement of affirmation that comes from mutual commitment. I am so grateful that excellent women have been sprinkled along my life path who have invested deeply in my own emotional and spiritual health. I never could have written books, had a national and local ministry, finished the course as an intentional mother in my home, and stayed faithful to my marriage without the help, support, comfort, and strength I received from other women. Differing in age, personality, educational background, and life experience, they each added a grace to the treasure chest of wisdom stowed inside my heart. Each has helped me to flourish when otherwise I would have floundered. As I began to grasp and appreciate this kind of intentional mentoring, love, and encouragement in my own life, it became a poignant focus of relationship that I wanted to pass on to my daughters. Understanding that influence is best cultivated through love and friendship, I sought to deepen my sympathy for what was going on in their hearts, to understand their personalities, to affirm their intrinsic worth to me and to God and to others, and to encourage them on a daily basis. 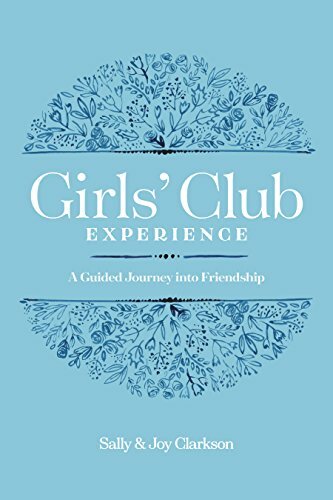 This book is our story as well as a gathering of convictions that each of us holds about the importance of cultivating female friendships that not only provide emotional affirmation and acceptance but also inspire, educate, train, and stretch us to live into our God-given potential. As we seek to invest our lives for God’s glory—and satisfy our longing for meaningful and intimate companionship—we are held firm by the friendships we have invested in over time. Cultivating such friendships may take years of making memories, sharing seasons, and initiating, but these friendships become the backbone of holding lives together. I am a different person because of the faithfulness, encouragement, and inspiration I have received from my friends and my daughters. 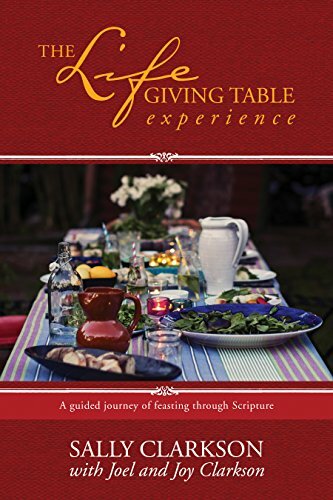 It is our hope that this book will encourage you to take the initiative to seek out women with whom to share and shape life. We pray that some of our ideas might spawn other meaningful groups and friendships. We hope you will discover anew the gift of intimate companionship with women who support each other to live deeply into the amazing potential God intended us to experience.